Concerts aren’t usually the first things you think to do with children, but there are several venues in and around D.C. that offer performances tailored to children or would be fun to enjoy with older kids. If you are looking for some musical entertainment while you are in the city, check out some of the options below. Metro Stop: Foggy Bottom (plus a bit of a walk) or take advantage of the free Kennedy Center shuttle. For more information about the shuttle and other transportation options click here. The Kennedy Center hosts performances appropriate for young children throughout the year. Visit family programs for a current list of performances. The Teddybear concerts are especially good for young children. They are held in a smaller theater and are geared towards a child with a short attention span. Be sure to arrive early to practice playing the instruments before the show. 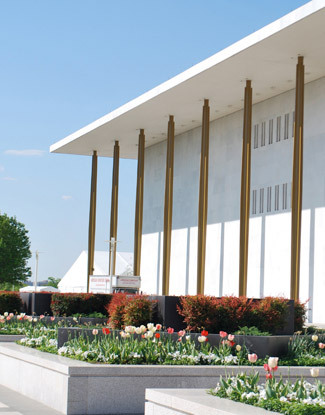 The Kennedy Center also offers a free performance every night at 6pm on the Millennium Stage. This is a very casual venue and depending on the performance it would be a great way to introduce your children to the arts. There are tons of venues in DC that host concerts big and small throughout the year, but you will find these are not usually appropriate for children. As with any big city, we have everything from opera, to musicals, to the biggest country stars. For kid friendly performances check out some of the venues listed below. The Verizon Center is our big downtown arena and hosts not only concerts, but also shows such as Disney on Ice, the circus and hockey and basketball as well. Click here for more information on upcoming shows and sporting events. It is located in the heart of Penn Quarter and Chinatown and as would be expected, there is a lot to do in the area. There are several museums within walking distance (National Portrait Gallery, The Spy Museum and the Museum of Crime and Punishment) as well as lots of family friendly restaurants to choose from. Don’t miss Pitango Gelato or Red Velvet Cupcakery for a sweet treat. Location:Located on the National Mall at 7th Street and Constitution Avenue, NW. During the evening, when the Sculpture Garden is closed to the public, access to the skating rink and park is restricted to the entrances at Constitution Avenue and Madison Drive near 9th Street. During the summer months on Fridays from 5pm – 8:30pm the National Gallery offers free concerts in their sculpture garden. Antsy kiddies can explore the sculpture while you enjoy some jazzy tunes. Click here for this year’s schedule. There are several outdoor concert venues outside of DC. Wolftrap, Nissan Pavilion (also known as Jiffy Lube Live) and Merriweather Post Pavilion are the three biggest and host big name concerts during the summer months. Check their websites for a schedule of shows. You will need a car to reach all of these venues. Of the three, Wolftrap National Park is the most likely to host kid friendly shows. You will often find matinees on the weekends and you can take your own picnic lunch or dinner and enjoy an afternoon or evening on the grounds of the state park or on the hill overlooking the stage. Because there is general seating on the hill overlooking the stage older kids can wander rather than having to stay in their seat. 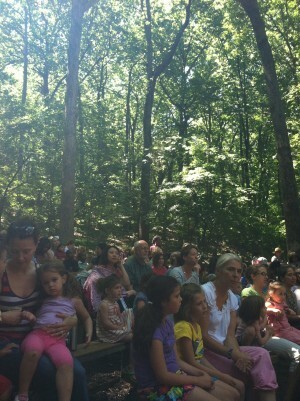 Wolftrap also offers a summer children’s concert series called Theater in the Woods, with morning performances this is a great option for families.